Written by CNET's Rafe Needleman, the Real Technology column appears Thursdays on CBSNews.com. Laptop computers are getting bigger and more powerful. But if you're in the market for a new portable computer, you can, and possibly should, buck this trend. 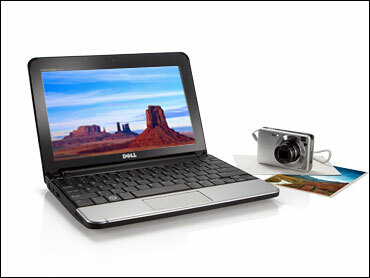 There's a new class of very small and inexpensive laptops, called "netbooks." You might well find that one of them offers everything you need in a laptop. And nothing you don't. Business execs have historically been the primary buyers of tiny laptops, especially expensive, thin-as-can-be, powerful "ultralight" laptops like the Lenovo Thinkpad X200 and most notably Apple's MacBook Air. In contrast, netbooks are small if not exactly thin, relatively low-powered, and best of all, cheap. A netbook, unlike a full-on and full-size laptop computer, can't replace a desktop. They're too underpowered for popular PC games, lack the storage to hold an entire family's library of photos, videos and music, and their small screens and keyboards can make them tiring to use. They're companion machines, meant to supplement the big iron you keep at home. Think of a netbook as you would a subcompact car, like one of those Smart city cars: It's good for getting you around town. It's inexpensive to own and operate. You can park it anywhere. But there's no way you could fit your family of five, the dog, and all your camping gear in one to go on a summer driving vacation. That's what you have the SUV or the minivan for. The earliest netbooks, and still today some of the cheapest, don't even run the Windows or the Mac operating system that consumers are accustomed to. Instead, they run customized versions of the Linux operating system. Linux has several advantages over Windows: The software itself is free or cheap to manufacturers, which keeps netbook prices down, and Linux generally runs well on lower-powered computers, which netbooks are. With Linux you don't get access to all the popular apps you can get on a Windows or Mac computer, but you can run many strong apps, most importantly the excellent Web browser Firefox, which opens the entire Web to you, including your e-mail and good productivity apps, like Google Docs. In fact, the "net" in the term "netbook" came about because the first products in this class were so under-powered they couldn't really function as standalone computers, and relied on a network connection for their core functionality. Thanks to the rise of pervasive WiFi connections at homes, workplaces and "third places" like airports and coffee shops, and thanks to the release and continual improvement of online applications, having a computer that relies on a connection to the Internet for its lifeline isn't necessarily a limiting factor. Being able to get a full Windows laptop that you can jam into a corner of a briefcase or purse for only $350 is a sweet deal. But as I said, a netbook is best thought of as a supplementary computer, not a primary machine. I've been using one of the newest and most full-featured netbooks recently, the Dell Mini 10. It's a very strong product, but in using it you can't miss the biggest netbook limitations. For one, it's slow. It's just pokey. Most netbooks are, since the main netbook processor chip is the lower-powered Intel Atom. The upside is that this chip takes less power, so your netbook needs only a small battery, saving a lot of size and weight. And although Windows XP makes the machine familiar to use, XP itself is not a great operating system for a system that's supposed to be always-on and always ready. Open the Mini's lid and you either have to start the computer from scratch or wait for it to resume from its hibernation mode. Now, the upsides: The screen is small, but not too small. The Mini 10 is not nearly as cramped as some of the smaller and cheaper netbooks, which hardly show you enough to be useful, or which reduce the type size so much you can't read them without a magnifying glass. It's readable and big enough. Surprisingly, the Mini 10's keyboard is close enough to full size that it's easy to type on. The trackpad supports multi-touch gestures, like the latest MacBooks, even though it's tiny. And unlike some of the earlier and some of the cheaper netbooks, the Mini 10 has a proper hard disk, so you can actually store the files you'll need on the device. The performance is not that big an issue if you don't ask too much of the machine. For browsing the Web and basic productivity tasks, like e-mail, it's fine (unless you have to run Outlook on it - that app is a pig). As your only computer, a netbook would probably be a disaster. But as an adjunct computer to your main home PC, or as a general-purpose computer you keep in the living room or kitchen, or as a traveling laptop for people who like to pack as light as possible without spending a fortune to do so, a netbook is a great option.